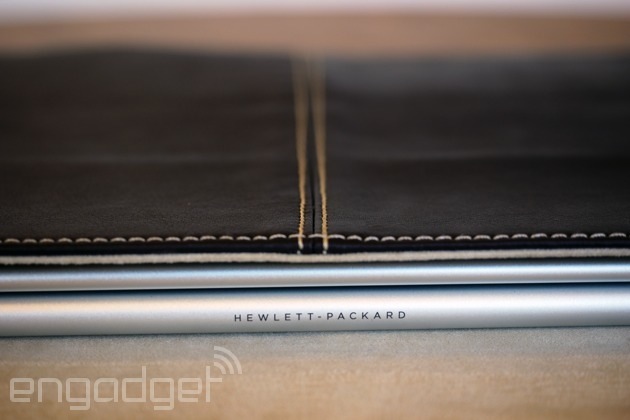 The Spectre x360 is HP's newest flagship notebook. It's also probably the closest you'll get to seeing Microsoft build its own laptop. You see, though the machine has Hewlett-Packard's name on it, HP designed it in close collaboration with engineers from the Windows team, optimizing everything from the fan noise to the screen's color gamut. The result is a well-built laptop with fast performance, long battery life and a nearly bloatware-free version of Windows. And at $900 to start, it undercuts almost all of its rivals. Is there anything not to like? The Spectre x360 is one of our new favorite laptops, thanks to its premium design, fast performance, vibrant screen and comfortable keyboard. It's relatively heavy compared to competing laptops, but it mostly makes up for it with nearly best-in-class battery life. How would you rate the Spectre x360? HP and Microsoft may have designed one of my new favorite laptops, but they hardly reinvented the wheel in the process. In fact, I think the pair owes at least a little credit to Lenovo, and maybe Apple, too. Think I'm trolling? Consider the evidence. As its name suggests, the x360 has a 360-degree hinge similar to Lenovo's Yoga series that allows the screen to fold back into tablet mode (and Tent Mode, and Stand Mode -- yep, HP even stole Lenovo's names for its different usage modes). Then there's the design. Like the MacBook Air, the x360 is fashioned out of unibody, CNC-machined aluminum, with a wedge-shaped profile that tapers subtly from back to front. It's not a wholesale copy-job, to be sure, but the machine's resemblance to a Mac is unmistakable. 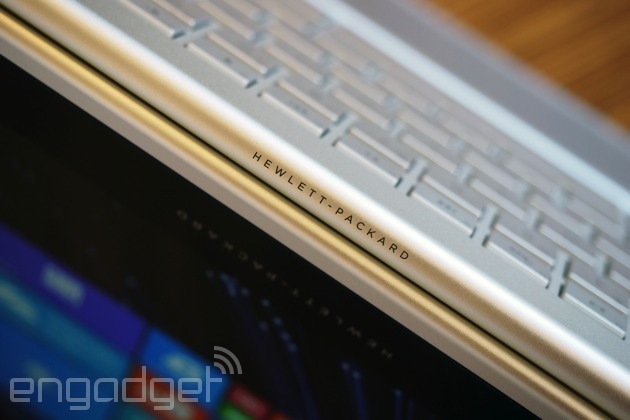 HP and Microsoft owe at least a little credit to Lenovo, and maybe Apple, too. 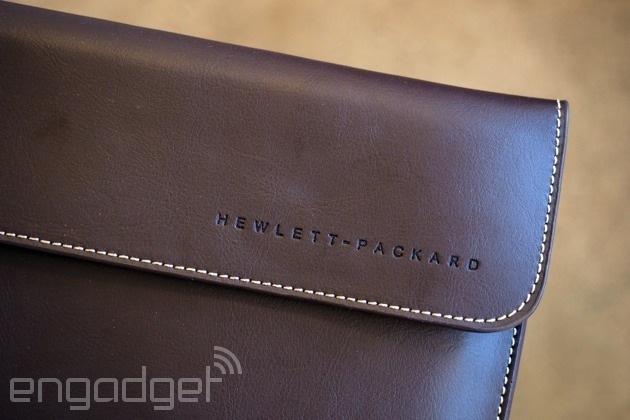 Still, HP managed to improve on what's otherwise a tried-and-true formula. Take the hinge, for instance. Though it feels as smooth and controlled as anything Lenovo ever produced, HP's version uses a different kind of mechanism that "folds into itself" (to quote what I was told when I first saw it). This allows the machine to be equally thick regardless of whether the screen is in tablet mode or folded shut, like a regular notebook. Speaking of thickness, the machine measures 15.9mm (or 0.63 inch), with the weight coming in at a relatively heavy 1.44kg, or 3.17 pounds on the Quad HD model. In fact, the x360 is actually 3.26 pounds on the full HD version (one panel is thinner than the other). Either way, it feels noticeably denser than a typical 13-inch Ultrabook, and it's definitely heavier than the super-light Yoga 3 Pro. That's irrelevant if you plan to park it on your desk and use it in Stand or Tent mode to watch movies, and it doesn't even really matter when you use the thing as a regular notebook -- it's still easy to tote around in your backpack or shoulder bag. What you might find, though, is that a relatively large, 13-inch PC like this, particularly one this heavy, isn't well-suited for tablet mode. If you do choose to use it that way, I suggest resting it on your lap; holding up a three-plus-pound device gets tiresome after exactly five seconds. In addition to that lie-flat hinge, the keyboard and trackpad are also entirely HP's -- and in some ways they're better than the competition, too. The metal buttons have a similar spacious, island-style layout as many rival machines, except the keys have a full 1.5mm of travel, making them much cushier than what I'm used to on Ultrabooks. (Perhaps this is one benefit to having a slightly thicker machine: less of a reason to settle for a flat, lifeless keyboard.) In addition, I appreciate how relatively quiet the buttons are, even despite their springiness. Also, most of the keys are large enough that I can find them by feel, without having to worry about hitting the wrong one. Even the arrow keys -- some of the few shrunken buttons here -- were easy to get to when I wanted to highlight text. What's funny is that although HP teamed up with Microsoft on this, it didn't use one of Microsoft's own "Precision" touchpads; instead, it went with a clickpad from Synaptics. Make that an extra-wide clickpad -- the trackpad here has much the same elongated shape as on the Spectre 13, HP's last-generation flagship. When that model first came out, the idea was that people could use so-called touch zones on either end of the trackpad to more easily pull off certain gestures specific to Windows 8 -- you know, like swiping in from the right to expose the Charms Bar. As it happens, the Charms Bar is about to go away in Windows 10 (set to launch in a few months) and so, there are no touch zones here, per se; just one really wide touchpad. HP figured, even if you don't need those zones anymore, you might still enjoy having the extra horizontal space. I have to say I do. In general, the touchpad is reliable; the cursor almost always goes where I intended, and multitouch gestures like two-finger scrolls work well, too. I would prefer a slightly lower-friction touch surface, but if a little more drag means more accurate tracking, then that's fine. 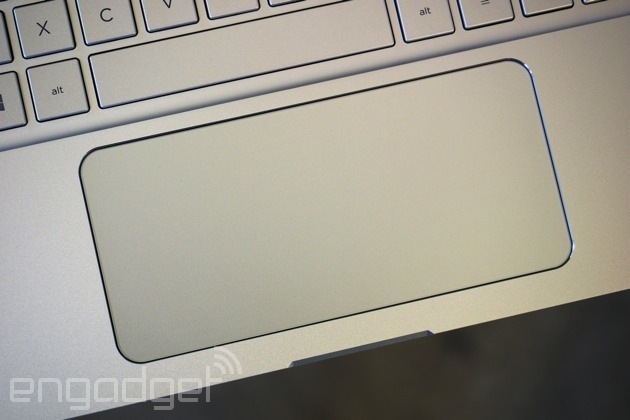 Better that than a smooth touchpad that doesn't actually do what I want it to. The x360 comes standard with a 1080p, optically bonded touchscreen, but is also offered with a 2,560 x 1,440 panel for an extra hundred bucks. Unfortunately, I've only had the chance to test the full HD edition, so I can't tell you firsthand just how pixel-dense the Quad HD option is. But I think I can guess, and I bet you can too. If you think the 13-inch MacBook Pro's 2,560 x 1,600 display is gorgeous, you will probably appreciate this as well. As it is, I didn't find myself pining for the sharper panel, especially considering how great the battery life is when you settle for the lower resolution. Thanks to a 72 percent color gamut, the tones here are nice and rich, though not overly saturated. Also, though the viewing angles on this IPS screen aren't perfect, they're wide enough that I could still watch movies and get work done with the screen dipped forward, within a certain range of flexibility. As for audio, the dual speakers on the laptop's bottom side exhibit some of the tinniness I've come to expect from notebooks, but it's no worse than what I've observed on other machines. Like so many other laptops coming out around now, the Spectre x360 makes use of Intel's new fifth-generation Core processors, code-named "Broadwell." In fact, the configuration I tested had the same 2.2GHz dual-core Core i5-5200 chip and 8GB as the Dell XPS 13, except paired with a different solid-state drive. Unsurprisingly, then, I observed mostly the same fast performance, including speedy seven-second boot-ups and resume times of less than a second. The benchmarks back this up too, with scores that largely match the XPS 13 (though the jury seems to be out on which is the graphics champ). Wireless performance is another area where HP and Microsoft put their heads together. The machine makes use of a 2x2 802.11ac WiFi radio, though the two companies claim it has stronger range than even similarly configured systems, with wireless throughput not dropping off as quickly in either the 2.4GHz or 5GHz bands. I'm not equipped to test that in any sort of scientific way, but I can say that wireless streaming was fast and reliable, and that the machine was also quick to reconnect after coming out of sleep. If there's one area where the x360 trails its peers, it's disk speeds. Though it does indeed come standard with an SSD (a Samsung-made one, in my case), these are of the slower mSATA variety -- not PCIe-based disks like we're used to seeing on other flagship laptops. That means while its peak read speeds of 555 MB/s are quite healthy, its max writes of 270 MB/s are relatively low. On some rival machines, you might see writes in the 500-and-something-megabytes-per-second range, and then there are outliers like the new 13-inch MacBook Pro, which delivered 1.3 GB/s reads and 643.6 MB/s write speeds. Again, none of that seems to have a negative effect on things like boot and app-load times, but depending on what you're doing and how hard you push the system, you may wish you had some faster transfer speeds. HP rates the x360 for up to 12.5 hours of runtime, depending on the configuration (meaning: The lower-res model lasts longest). Part of that's thanks to a large, 56Wh battery, but HP and Microsoft also pored over the system settings, looking for places where they could make the machine just a little more power efficient. Together, they decided to shut down certain parts of the system when not in use, including the sensors in the hinge that tell the x360 what mode it's in. They also aimed for low fan noise, in part to conserve juice (and I think they succeeded there). Meanwhile, the Quad HD panel uses PSR (Panel Self Refresh) technology, which avoids changing pixels unnecessarily to reduce power consumption. After speaking with an HP spokesperson, it's clear that the QHD model still doesn't get quite the same battery life as the 1080p edition, but perhaps details like that at least help close the gap. Again, I didn't test the higher-res version, so I can't say firsthand. All of this is to say, the battery life really is as long as promised. On the unit I tested, which had a 1080p screen, I very nearly made it to the half-day mark -- 11 hours and 34 minutes of video playback, to be precise. In fact, were it not for my aggressive test settings (WiFi on with brightness fixed at 65 percent), the machine would have lasted even longer. Either way, 11.5 hours is an excellent showing for a laptop this size. The only one we've tested that does better is the MacBook Air. Otherwise, the Spectre x360 manages to slightly edge out the new 13-inch MacBook Pro, which is in a similar weight class. HP's flagship also far surpasses plenty of lighter-weight Ultrabooks -- machines like the Yoga 3 Pro, Acer Aspire S7, the Samsung ATIV Book 9 Plus and Dell's new XPS 13. The Spectre x360 might be heavier than all those systems, but it at least justifies its extra heft with longer runtime. Given that Microsoft helped design the x360, it's fair to assume it also runs a relatively clean version of Windows. The operative word being "relatively." My test machine came with Netflix and The Weather Channel, as well as Hearts Deluxe and a few of HP's own apps, like Connected Photo. It also includes a free one-year subscription to McAfee's LiveSafe service. That security coverage is actually pretty useful, though McAfee's desktop pop-ups can be quite annoying (seriously, does it ever learn?). In any case, that little bit of bloatware disqualifies it from being one of Microsoft's Signature Series machine, but it's a clean build nonetheless -- definitely the cleanest I've seen from HP. Additionally, it should go without saying, but the Spectre x360 ships with Windows 8.1, and, like other Windows 8.1 machines, will be eligible for a free upgrade to Windows 10 when it comes out later this year. What's unique in this case is that because HP worked so closely with Microsoft, the x360 is perhaps better optimized for Windows than some of its competitors. For now, most of that optimization has centered on Windows 8.1, but representatives from both camps have indicated to me that after the x360 went on sale, they'd be shifting their engineering resources to focus more on Win 10. The Spectre x360 is currently offered in three configurations, priced at $900, $1,150 and $1,400. Starting with the entry-level model, you get the same Core i5-5200U processor I tested here, along with 4GB of RAM and a 1080p touchscreen. Of the three, this is the only one that's customizable, with options to double the RAM ($50), add a Quad HD screen ($100) or upgrade to a dual-core i7 processor ($150). You can also swap out the standard 128GB SSD for a 256GB one ($50) or a 512GB disk ($200). Moving on, the $1,150 model keeps the 1,920 x 1,080 display, but steps up to a Core i7 CPU, 8GB of memory and 256GB of storage. Finally, there's the top-of-the-line $1,400 model, which has a higher-res 2,560 x 1,440 screen and a 512GB SSD (in addition to a Core i7 CPU and 8GB of RAM). 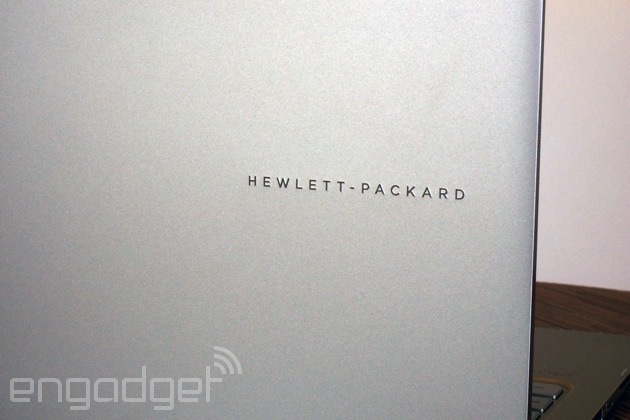 That's currently sold out on HP's site, but a company spokesperson says it should be back in stock within the coming weeks. Either way, if you were doing the math earlier, you saw that configuring the base $900 model with tricked-out specs comes to the same price of $1,400, so really, it's not actually "out of stock"; you just have to check off more boxes to get it. 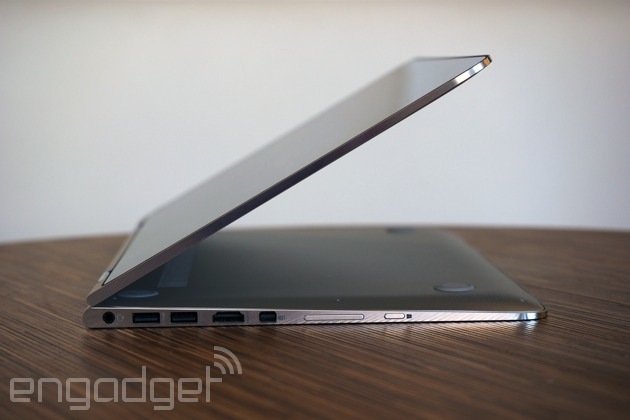 I've read other tech writers refer to the HP Spectre x360 as a "MacBook Air competitor." That's fair, but also a little lazy: It's a MacBook Air competitor to the extent that every Windows Ultrabook is. The point is, if it's a thin-and-light, high-end laptop you're looking for, you've got lots of options. Too many options, almost. For the sake of not overwhelming you, let's just focus on the best. Perhaps the most direct comparison would be to the Lenovo Yoga 3 Pro ($1,249-plus), which also has a 360-degree hinge and flagship specs. At just 2.6 pounds and half an inch thick, it is insanely thin and light, especially for a laptop with a touchscreen and a convertible design. That said, that thinness and lightness come with a couple trade-offs. For one, that compact design is only possible thanks to one of Intel's lower-power Core M processors, which, while perfectly adequate for basic tasks, is not as robust as a fifth-gen Core CPU. Two, there isn't much room for a big battery inside that slim chassis. Indeed, the battery life falls four hours short of what you'll get on the Spectre x360, though it admittedly isn't much better than other skinny Ultrabooks. If you can live without a convertible design, your options become even more plentiful. Our new favorite is the Dell XPS 13 ($800-plus), which crams a 13-inch display into the body of an 11-inch machine, making it way more compact than other machines with the same screen size. At 2.6 pounds, it too is very light for a touchscreen system, and we're fans of its comfy keyboard, fast performance, vibrant screen and surprisingly good audio. My main gripes are that the battery life is merely average, at least if you configure it with a touchscreen, and that if you do want a touch panel, it costs an extra $500. That's because the only touchscreen option has 3,200 x 1,800 resolution; you can't get it with a full HD touch panel, like with the Spectre x360. A shame, that. Other solid options include the Samsung ATIV Book 9 Plus ($1,299 and up) and the skinny Acer Aspire S7-393 ($1,300), both of which have been updated with Intel's new fifth-gen Core processors. Lastly, yes, there's the 13-inch MacBook Air, which starts at $999. This, too, was recently refreshed with Intel's Broadwell CPUs, with the battery life still rated for up to 12 hours. As ever, we enjoy the aluminum design (though it's slightly heavier than the competition, at 2.96 pounds), as well as the keyboard and best-in-class trackpad. The biggest trade-off you'll make here is the screen quality: It's the only laptop in the Mac lineup that doesn't have a Retina display; just 1,440 x 900 on the 13-inch model. I asked at the beginning of this review if there's anything not to like about the Spectre x360. Indeed there is: the machine's relative heaviness. At three-plus pounds, it's hardly a clunker, but it is noticeably weightier than other 13-inch machines. Curiously, though, that weight also makes possible so many of the things I like about the laptop. Because the x360 is slightly bulkier than its rivals, it can accommodate a cushier keyboard and a bigger battery, allowing for nearly best-in-class runtime. It also makes room for a ton of ports. If you're shopping in this size class, I'd also suggest you consider a few other models, like the lighter-weight Dell XPS 13, but even then, the specs HP offers for the money are hard to beat. Particularly if you prefer something with a more convertible design, the x360 is a strong -- and reasonably priced -- choice.